I'm being asked a lot now about how to learn to sew, and since my method, although ideal (get my mom to teach you) is somewhat impractical to recreate, I've been looking at gateway-drug, I mean introductory, sewing books. Sew What! Skirts looked good from the get-go, and I wasn't disappointed. It's not just that several of the skirts offer pockets (albeit simple patch ones), or that the idea is to learn fitting techniques that you can apply across multiple (patternless) skirts, or that rickrack features prominently. 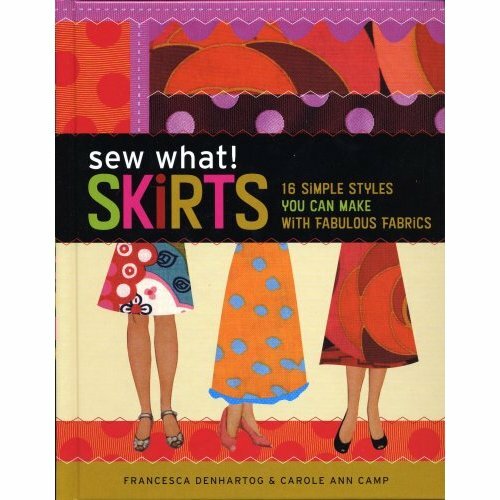 It's that I think that the authors (Francesca Denhartog & Carole Ann Camp) have figured out what motivates beginning sewists: it's the fabric, stupid. Fabric is what draws folks in. It's the promise of taking that gorgeous yardage and draping it around oneself (or one's home) that leads people down the path towards the $7000 Bernina. And in every home-ec horror story I've ever heard, the indignity of having to make something useless has been compounded by the useless thing having to be done in boring, hideous, cheap fabric. The fabrics shown in this book are, frankly, awesome. Beautiful patterns, lovely weaves; not a scratchy double-knit in the lot. The skirts are wearable, the instructions clear. This is a very good book for beginners, in that it explains *everything*. The instructions stop just short of including "Inhale. Exhale." They also, bless them, allow for the possibility that you might screw up, and screw up badly. They advise you to leave extra seam allowances so that you can fix your mistakes, for example, and tell you to start with cotton, as it's easier. Lately I've been feeling a bit guilty about some of my sewing cheerleading — I'm worried that I'm making it sound too easy, and that I've forgotten how hard it was for me to learn some techniques — things I could do backwards in a hailstorm now, but which occasioned many lonely hours with a seam ripper before. Part of that frustration was me being an impatient teenager, sure, but part also is just doing and doing and doing until you can feel when you have something right. This book has a little of the same cheerleading problem, but since it's at such a basic level, and advocating a do-your-own-thing, "it's not a flaw, it's an interesting design decision" attitude, I feel as if it's warranted. The only change I would have made would be to emphasize more the need for practice. Sewing, I've come to realize, is a lot more like athletics than I'd like to admit. Despite having been, at one time or another, a cross-country runner (slowly), a college soccer player (ineptly, and inept in Div III at that), and a discus and shotput thrower (not very far, and not for very long), and despite my obsession with roller-skating, I think of myself as profoundly unathletic. So the realization that sewing, like other muscle-memory activities, is something that you just can't read a book on and be note-perfect at, was one that was slow to come to me. But, just as you don't have to train for a marathon to enjoy running for exercise (shudder), you don't have to practice couture techniques to make a perfectly lovely skirt. All you have to do is practice, period. Those practice runs are still exercise, even if they aren't marathons, and those practice garments are still wearable — and if you are patient and follow the instructions in this book, they'll be better than wearable. So: this is a good book, especially for beginning sewers. Fabric is good. Experimentation is good. You (too) can be good. Take it to heart, and take your heart to the sewing machine. I borrowed this book forma friend…and I was dissapointed. I started out all excited by the photos and the easy directions. But, when I made the “pattern” it turned out just awful. Nothing fit and I had to keep making adjustments and I never got it right. I am going to try again using a skirt I already own that fits and using it as the pattern. Sewing certainly is practice and paitence.My first couple of projects I was so proud of at the time but now I can see how un-practiced they were! excellent post! I taught a sewing lesson a few weeks ago to a brand new sewer and it was quite a jolt to remember how hard it is just to sew in a straight line and maintain the same width for your seam allowances. But at the end of our lesson she had a skirt and she was really excited about it. (I learned by your method, too–I probably put in my first zipper at about age 14 but I think that one I can still remember how hard it is!). I bought it – I’m curvy, so hopefully I won’t be disappointed! Thanks for reminding me about the practice & muscle memory bits. I just started teaching my 11 yo niece to sew with a skirt, from a pattern. I think I will print out your post and read it to myself before each lesson.I’ve already given her a little speech about how I’m going to make her do things she thinks are stupid, like pressing seams, when all she wants to do is SEW SOMETHING, but that I have already taken every shortcut and usually end up regretting it. Doubt she believes me, though.Since she is 11 and as yet uncurvy, I think Sew What Skirts might be a good birthday present for her. Thanks for the recommendation for this book. I am definitely adding it to my collection. I have seven granddaughters and am trying to teach them all how to sew simply. My favorite sewing instruction books are the ones from the 1940’s and 1950’s – they take a simpler approach to sewing. I have some of those those books, too. My favorite sewing machine (one of three) is my Singer treadle from 1923. Non-electric sewing! I learned how to use this machine when I was seven years old and starting making my skirts for school – little gathered skirts to go with the little white blouses by mom got from Danburg’s for about about 50 cents. By the way, cotton fabric was four (on sale six) yards for $1.00 – I could get at least two gathered on a waistband skirts for $1.00. Guess that tells you how old I am, huh! I was flipping through this book a few weeks ago at a used book store and passed it up! Stupid! Why? Because I had no money. I’d spent it all on fabric.Woops. I am sorry I did not mean to sway so many way from the book. I just wanted to share my experience. It might just be my skills aren’t up to it. I am thick waisted, have a little belly and narrow hips– so that may be the problem. I may have drafted the pattern wrong. There is other useful information in there, however, so it was not a total waste of time. I’ll just stick to store bought patterns for skirts and use the lovely photos in Sew What Skirts! for inspirations for modifications. My experience with teenagers and a) getting them interested and b) teaching comes down to two things.First and absolutely foremost: The end product has to (HAS TO) look like what they can buy in the store and what their friends are wearing. I was not even able to get my teenage daughters within smelling distance of a PATTERN before I demonstrated to the younger one, who is ferociously curvy and short, that I could reproduce wide legged jeans like her friends were wearing. Once I did that, they got interested, if only because it seemed to eliminate the whole “humiliation in the try-on room” thing. And the second thing is – to absolutely NOT try to steer them in the direction of “simple/easy/useless” items like aprons in order to teach them. I don’t care how long it takes. I don’t care how far down the difficulty scale I have to break the process down (like, this is how you put the pins in; this is the direction of the fabric; we’re going to measure your front half separate from your back half; line up the edge of the fabric pieces on that line on the sole plate, etc. ), the only way I was able to get my girls to complete a project was for them to find something they wanted – in the store(take your cell phone and take a picture to use as resource material), in a magazine,etc. and take that idea to the pattern books and explain in detail how they can make the pattern work, and spend the time necessary to find fabric THEY want that is going to look great when it is done. Having something that looks great, feels great and elicits “the twirl” (they stand in front of the mirror and twirl around with a huge grin on their faces)is the goal. My girls did not seem to care if they got it done in a weekend or it took several weeks as long as it all came out a) making them look great and b) they could blend in reasonably with their friends but it would be different enough that someone would ask where they’d gotten it. My two cents. I love, love, love this book! I’m considering myself a pretty beginner sewer – it’s been MANY years since junior high home ec classes, and living at home with my brilliant seamstress mom! My mom has also made a point of encouraging me to practice, practice, practice. Nothing is a failure – it’s a learning experience!I’ve got a pretty out-of-proportion body – very “top-heavy”, with a big belly, but smaller hips. I actually have learned some good, albeit pretty basic, fitting tips – I’ve been able to make skirts that fit me, and don’t flare out in wierd places, and look cute and unique! Some of the skirts have involved more trial & error than others, but all-in-all, I think it’s terrific. Sad fashion news- Liz Claiborne died yesterday. I love the statement about practicing. I go through phases with my sewing too – sometimes I want a challenge, sometimes to try new techniques, sometimes I just aim for fit, and sometimes I just want to wear that thing next week! So even when I’m screwing up or screwing around, I’m still getting in my practice. I learned from my mom when I was 12, now I’m 28 and more ‘practiced’ than her, and I get kinda giddy when she comes to me with questions and advice! But she does have more talent than me, try as I might I can’t do anything perfect, she can’t do anything imperfect. Does the book address using border prints at all? I’d love to make skirts with border prints, but it seems impossible (to my novice mind). The borders are straight and the hem of a full skirt is roundso how would one achieve this? Godets and lots of wasted fabric? What a great post and helpful comments for me, a beginning sewist!! I need to be reminded to just keep sewing even if the results aren’t always great. I’m on the waiting list for the skirt book at my library because I don’t want to commit yet. I do own Sew-U by Wendy Mullin (thanks to Rebecca! )and made a skirt from it. I liked it and thought it answered my questions well. I totally agree with what twollin said as I remember my experience trying to sew as a teenager. I lusted after fabric, but wanted the quick way and so chose the simplest patterns which yielded odd, shapeless garments. ugh. I hope my daughter is interested in sewing because she wants to be the successful designer of her wardrobe. AND I WILL TEACH HER. margo, thank you! That’s a great skirt pattern for my border print. I get it now, how to make it work by narrowing the waist/hip area with pleats. I’m still disappointed that I can’t make the pattern I planned for it, but at least the fabric will be used as intended. twollin is spot on. However, it’s not just teens that want to produce something cool to wear that fits well. That would apply to all of us at any age. I believe the pattern companies are missing the mark by producing such poorly drafted patterns that few beginners get past the first attempt. I haven’t seen the book but if it inspires young girls to sew since they no longer have home ec than it’s a good thing. I bought this book and made a skirt from it, and I love it. I’ve got hips, so I had to put darts into one skirt, but I found that it fit great afterwards. The skirt I made was for a wedding, and it worked very well for that purpose! I’d recommend this book highly. Oh, and I’m a novice at the sewing thing to, but I found the directions easy to understand. This book is so much fun! Thanks for the reminder about practice. We have been in the middle of a move for over 7 months. One of the first things that got moved was my sewing room things including my sewing machine! Except for some hand sewing I haven’t been able to make anything for over 6 months. I will have to remind myself next week when we should be in the house that I’m out of practice. I can hardly wait to try making some clothes since I’ve lost over 20# since the last time I made anything for me. Thanks for the heads-up on a great looking book. Since I collect books the same way I collect fabric, patterns, buttons…I’ll have to check it out. I just wanted to comment on the $7000 sewing machine! When I bought my Viking it was $4000 and I thought I had gone a little overboard and crazy, I can’t imagine spending $7000! Hi, Erin, I had to send you this link:http://referencelibrary.blogspot.com/2007/06/elsa-bloom.htmlbecause I immediately thought of you when I saw the photo. The blog even has a fabric category, so you can look at lots of fabric, which I surmise are things the blogger wanted on eBay but didn’t get. I learned what little I know partly from my mother (who considers herself to be mediocre at best; she doesn’t have a lot of formal background but has an eerie natural talent for handicrafts so things tend to come out better than her training warrants) and partly–largely–by some trial and whole lot of error. I need to get that book. I’m a complete skirt fiend. I agree wholeheartedly with your review. I bought this book (and Lotta Jansdotter’s Simple Sewing) the night I bought my sewing machine – a month ago. I’m a complete sewing novice, and I’ve successfully made three skirts. Woo hoooooo! I am just *loving* that I can make clothes for myself! And I especially love that the patterns I make are tailored especially to my “curvy” proportions and I don’t have the disappointment of making a store-bought pattern that just doesn’t fit properly. It is so the fabric…and you have to check out Francesca’s fabric store: http://www.valleyfabrics.com. The selection is really amazing. I leave with the coolest printed fabric, and I can’t wait to go back for more. She really knows how to find some great prints.There are some great skirt ideas, although I have to agree that the book is written for figures that aren’t curvy. This might deter some newbies, but it is a great opportunity to teach yourself how to make things fit – and how to place and sew a dart (which some of us need to make these skirts work). “…backwards in a snowstorm”? I love it. Never heard that expression before. Did you make it up? Great post. I love books like this – there should be more. Hey I searched on the author for the skirt book (cos I am just researchy like that) and came up with a fabric store that will definitely be seeing some of my hard earned bucks. They even have some silks to fantasize about buying 🙂http://valleyfabrics.com/about_us.cfmSee this is why your blog rules. pretty kewl. Hi there. I’ve been reading your blog for a while, now, and I wanted to thank you (a bit belatedly) for reviewing this book. I’ve only just started messing around with sewing, and I found this book to be a great place to start. Making skirts is a lot more satisfying than making tote bags or aprons, and I love the flexible patterns (although I’ve just started sewing, I do a lot of knitting, and I never knit to the pattern; what’s the point of making your own stuff if you still have to try to conform to standard sizes?). So far I’ve made three skirts which, while not perfect, are immanently wearable and totally mine. So, thanks!